Premium-Quality TENS electrode replacement pads compatible with TENS 7000 devices. Twenty replacement electrode pads which measure 2"x2" and are compatible with TENS 7000 devices. Our high-quality electrode pads have a premium reusable hydrogel layer with medical grade non-woven material backing. 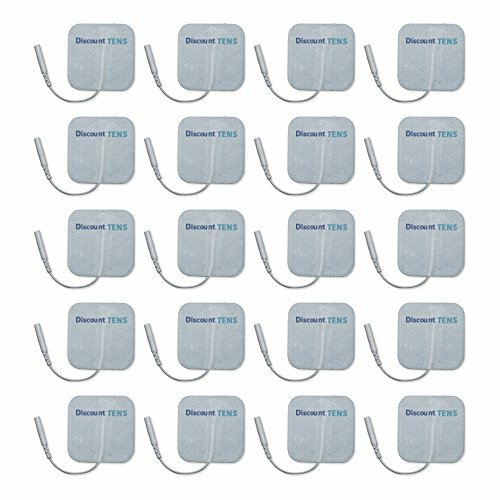 These Discount TENS electrode pads are compatible with TENS 7000 electrotherapy TENS devices and any others that use standard 2mm pin connectors. Discount TENS brand TENS replacement electrodes that are compatible with TENS 7000 electrotherapy devices. Replacement tens unit pads are durable, self-adhesive and reusable. Replacement electrodes for TENS units that use 2mm pin style connectors. Affordable, premium quality replacement electrodes compatible with TENS 7000 TENS units. Very durable and flexible, Discount TENS brand self-adhesive electrode pads are easy to remove with no sticky residue left behind. If you have any questions about this product by Discount TENS, contact us by completing and submitting the form below. If you are looking for a specif part number, please include it with your message.